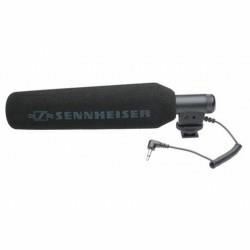 Sennheiser EW135-P G4 Mikrofon Kamera Mount Wireless Cardioid Handheld MicrophoneGenerasi keempat dari evolusi nirkabel membuat teknologi nirkabel profesional menjadi lebih fleksibel dan lebih mudah. Untuk musisi, pembicara Sennheiser G4 microphone sangat ideal untuk kebutuhan Anda.Ew-135 P G4-A ada..
Sennheiser EW 135-P G3A handheld system designed for field operation: this system is the perfect choice for ENG professionals. The rugged hand-held cardioid wireless microphone provides professional sound quality for interviews and reporting, even under unfavorable conditions. At the camera end of t..
Sennheiser ew 122-p G3High-quality reporting set: ME 4 cardioid clip-on microphone for prominent voice reproduction free of background noise, EK 100 G3 adaptive diversity receiver, SK 100 G3 bodypack transmitter.OverviewThe ME 4 clip-on cardioid microphone compliments this ENG set by blocking out ex..
Sennheiser ew 112-p G3Robust, user-friendly, and comprehensively equipped reporting set: EK 100 G3 adaptive diversity receiver, SK 100 G3 bodypack transmitter with Mute function, ME 2 cardioid clip-on microphoneFast, flexible and professional: these characteristics make the ew 112-p G3 the perfect f..
Shure VP 83F Mikopon Untuk KameraShure VP83F LensHopper merupakan mik khusus kamera DSLR dan Camcorder HD. Shotgun Mic ini memberikan hasil audio high-definition dengan respon low-end yang penuh serta kemudahan akses dan kontrol sehingga dapat dengan mudah menyesuaikan dengan kondisi lingkungan pere..